The popular TV3 technology program “Generació Digital” has dedicated some time to the Cleandrone project. Valldoreix Greenpower has created a new spin-off company for the development of the patent pending Cleandrone system: Cleandrone, S.L. 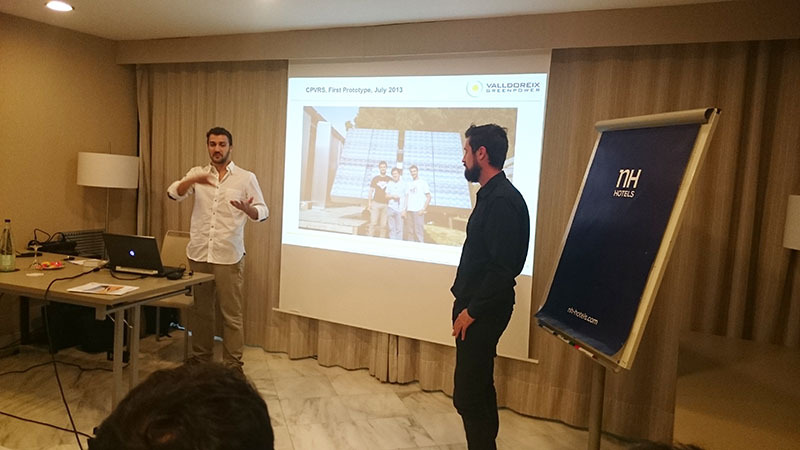 Valldoreix Greenpower, together with other investors, has created a new spin-off company for the development of the patent pending Cleandrone system: Cleandrone, S.L. In its first finance round the company has raised 120K euro. 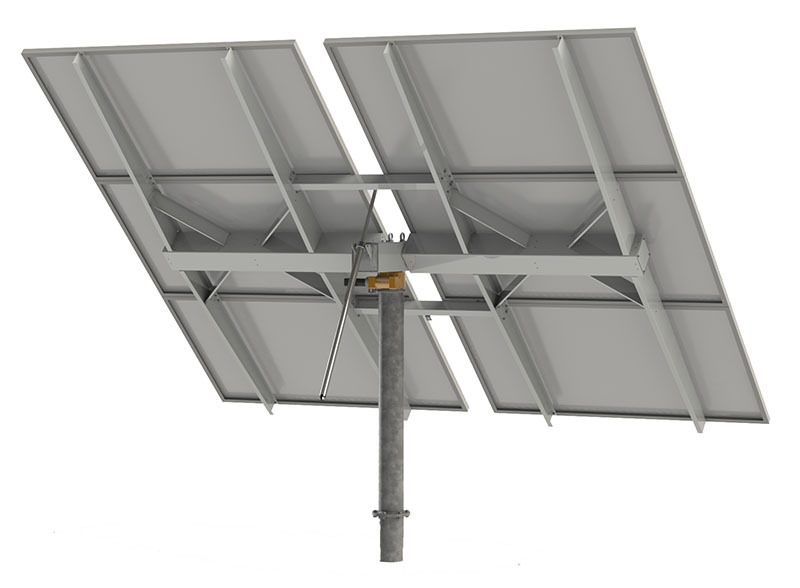 VGP PVHT 2106 is our new solar tracker. It is a single-axis tracker that will allow you to increase the performance of your installation up to 30% compared with fixed installation. Each tracker includes 108 REC 315PE72 PV modules reaching a total of 34 kWp. Also available with 72 cells CSun modules. You can also get the tracker without modules and we can adapt the design to other brands you chose. Its continuous tracking system is based on a brushless stepper motor and enables accurate movements, a reliable and low power consumption and a minimal maintenance. This system features advanced technology that adapts to your needs and it is available with or without inverter according to the type of you PV installation. In this case our VGP PVHT 2106 tracker integrates an ABB PRO 33 three-phase inverter, which is an ideal option for those photovoltaic installation below 500 kWp. With this solution you can avoid using string monitoring boxes as the included inverter features an individual string monitoring, which facilitates installation and simplifies monitoring and maintenance. On the other hand, we also introduce the option of getting the full tracker system without inverter, which is a highly recommended alternative for photovoltaic plants above 500 kWp. 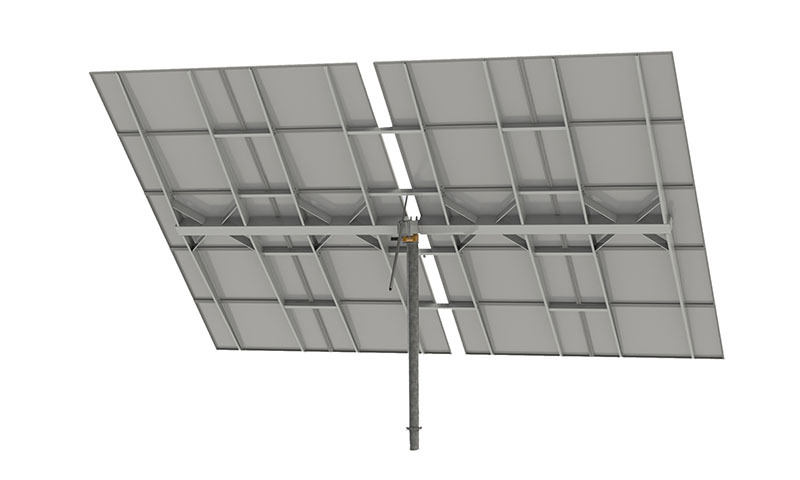 Thanks to our design, tracking electronics and motor can be fed with direct current and thus by the energy generated by the PV modules, connecting to one of the PV strings. With this possibility, we offer you the advantage of avoiding the need to connect the tracker to the AC grid. The fact of being a single-axis tracker allows to reduce costs and to increase the energy production thanks to its east-west movement. In addition, our exclusive design allows to increase the number of modules installed, incrementing the output density of the system and thus further improving the profitability of your PV project. 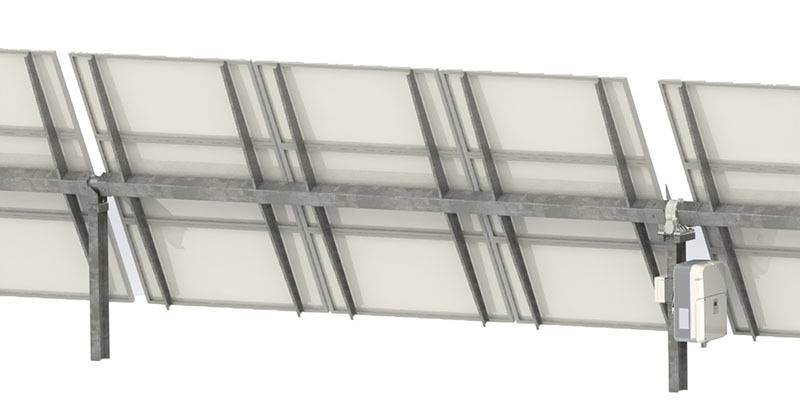 With VGP PVHT 2106 we bring you the solution for building large, reliable, profitable and highly efficient solar farms. The use of solar trackers is increasingly common in photovoltaic plants, since solar industry has proven the great benefits they have. The trackers allow a significant increase in energy production and therefore improve project profitability. Before further explaining the objective and the operation of solar trackers, it is essential to explain the movements of the sun and to understand how they directly affect the production of solar energy. Rotation and translation movements are the responsibility of the seasons, the succession of days and nights and the temperature differences around the world. Solar radiation depends on these movements and will change depending on the latitude and the time of the year. Sun’s position, directly affects the angle of incidence of the sun, and is determined by the elevation and azimuth angles. 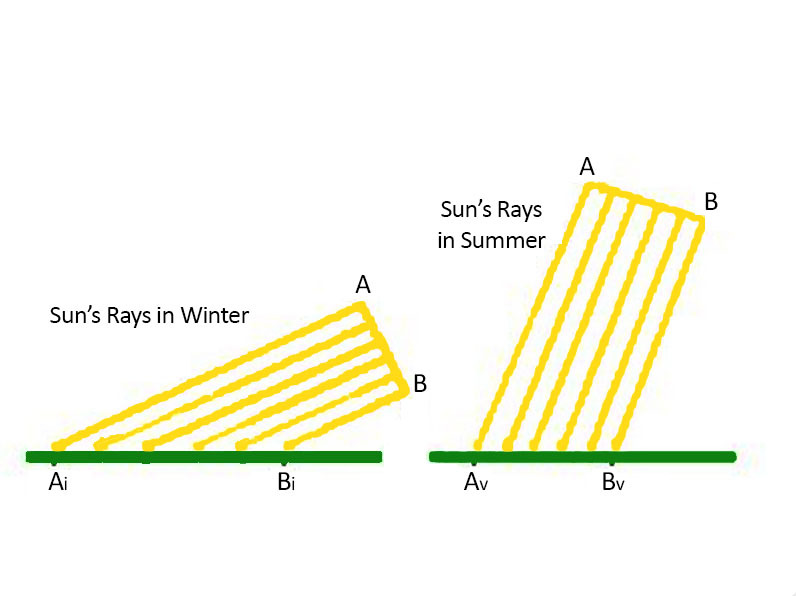 This image reflects the incidence of sun’s rays at noon and on a horizontal surface in winter and summer. As we can see, in winter the slope is maximum and the energy power of sunlight is minimal. In addition, due to the rotation, the sun is low in the sky and is visible a few hours a day. On the other hand, in summer, the sun travels through an orbit that makes it to be higher in the sky and to remain visible more hours a day. So, the sun's rays fall more perpendicularly and with much greater energy efficiency. This effect is accentuated the further you are away from the Equator line. So, in regions near the polar circles, days are longer in summer and shorter in winter, while in other areas closer to Ecuador, there is much less variation between the length of night and day. Thus, daily and annual solar trajectories of a location vary depending on the latitude, and they directly affect the angle of incidence of radiation, which is a key point in producing solar energy: the higher the angle, the greater production. Therefore, it is essential to know the exact orientation and inclination of our location, in order to guide the panels of our installation so that we can maximize solar energy. PVGIS is a very useful tool to calculate the slope needed for your photovoltaic installation based on your location. The application also allows you to compare the production you can get according of your type of installation (fixed, single-axis trackers or two-axis trackers). Click here to calculate the energy you can produce depending on your location and your type of installation. 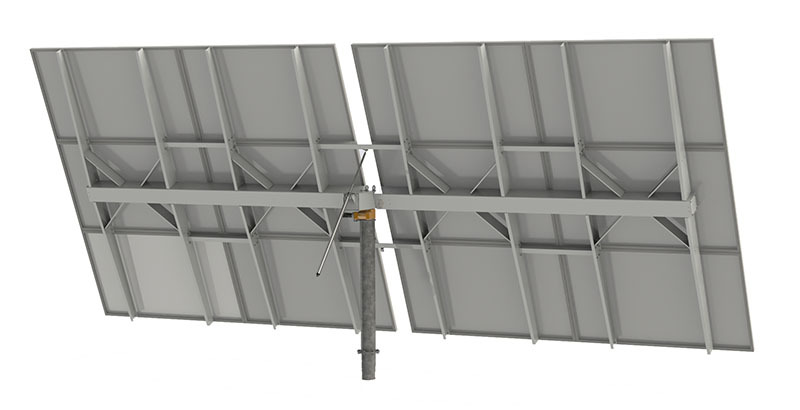 Solar trackers are composed of a fixed part and another movable, with the objective of following the sun’s movement and of orienting the PV modules perpendicularly to the sun. Thus, you can increase the collection of solar radiation and consequently the energy supplied by the installation. 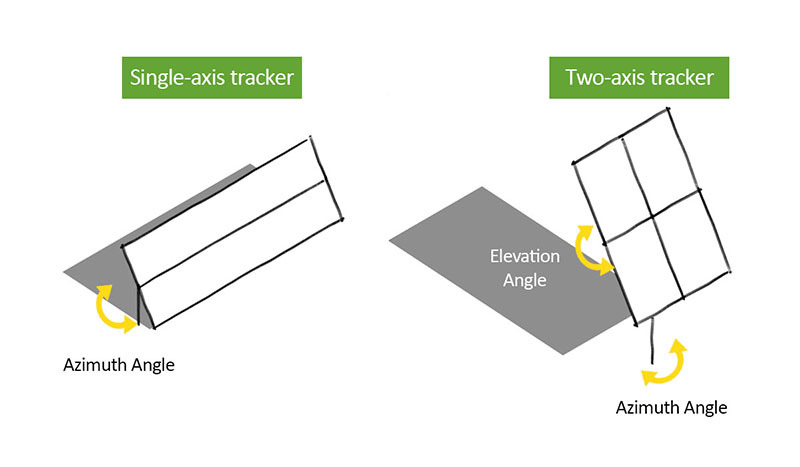 There are two main types of solar trackers depending on its movement. - Single axis: the rotation is done on a single axis, which can be horizontal, vertical or oblique. - Two axis: besides moving along the azimuth, they also follow the elevation angle of the sun, thus achieving a full tracking. Thanks to these moves, you can increase the production of electricity with respect to fixed installations up to 30% with single-axis trackers and up to 40% with two-axis trackers. At this point it is clear that through the movement of the trackers it is greatly increased the amount of radiation received by the panel and consequently the energy produced. In the following graph we can see it better. In this picture we can see the energy produced over a day with a fixed PV installation as well as with one with PV trackers (in this case of two-axis). 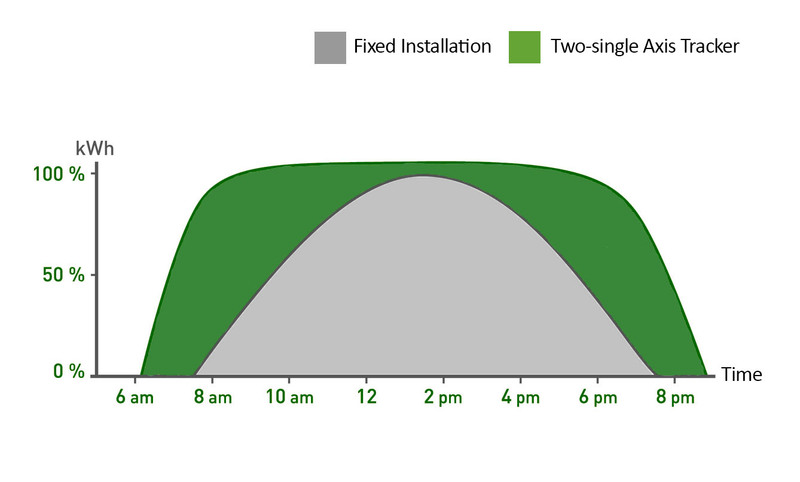 The grey curve shows the energy obtained with the static installation, while the green curve shows the result of the installation with two-axis PV trackers. Both installations use the same panels. As we can see, the panels fitted with solar trackers have received more solar radiation, and therefore have produced more energy throughout the day. The performance has increased about 40% compared to the fixed installation. Another very important aspect to emphasize is that thanks to solar tracking not only the production of energy increases, but also improves the way the power output is delivered. With solar tracking you can extend the time of available maximum power and thus produce with greater capacity more hours a day. Let's go back to last picture to understand this concept. In the dark curve we see an evolution of the power output throughout the day, it gradually increases until peaking at noon, then returns to decrease. But, in the green curve, we see how we approach the maximum power from early in the morning and that this production is maintained until late afternoon. Let’s give an example. If we have installed a solar pumping system that to operate need its panel working at 75% of their capacity, with a fixed installation, the system will only pump about 4 hours a day (in the hours of highest solar radiation) while with PV trackers, it will pump up to 10 hours. At Valldoreix Greenpower we have developed our own solar trackers with plug and play systems and a unique technology that ensures reliability and high efficiency. VGP PVAST 098, VGP PVAST 196 and VGP PVAST 327 are our two-axis trackers and VGP PVHT 2106 is our single-axis tracker. We have a great experience designing PV projects, and we are able to adapt to your need so that you optimize your installation and obtain the highest possible efficiency. 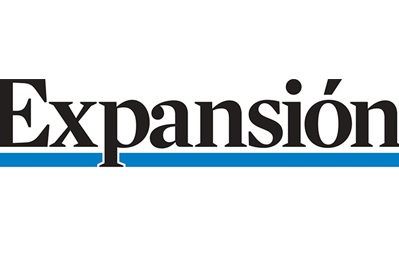 Ricard Pardell, CEO of Valldoreix Greenpower, interviewed by the newspaper Expansion to talk about our finance round. Yesterday, we attended the Keiretsu Global Forum to present our Business Plan 2015-2020, on the occasion of a finance round we have started. Days earlier, in a journey to select companies, the jury chose our innovative project between other 30 proposals. Borsa de Barcelona (Market Stock) was the place where private equity investors discovered possible projects to invest in. After the exposition of 8 companies, there was a time and space for networking, ideal occasion for exchanging ideas and make contacts. Our finance round remains open. The goal is raising 400 K € with which we hope to increase the production and manufacturing capacity of our exclusive CPVRS system. Ricard Pardell used his presentation to present our business plan and also to show his professionalism and experience. His extensive background includes over 10 years of experience in solar energy field. In 2010 he sold his old company Abengoa, which represented a yield of 10% of the initial investment for investors who trusted him. That is what we expect with this new finance round. To increase VGP production capacity, in order to new investors can get high returns. We would like to inform you our crowdfunding campaign, started last April 15, has had to be canceled before its scheduled closing date. The campaing, conducted by Mynbest, has not achieved the expected results (15% of the target with just two weeks remaining) and we have decided to cancel it to be able to find finance through other ways. The fact is, many investors A Class which we have started negotiations with, have been reluctant to invest in a crowdfudning round. We have arrived to the conclusion that carrying the crowdfunding label has not benefited us as we initially thought, it has even been negative. The reality is A Class investors prefer to have their own partner agreements and their own assessments, and do not like the idea of being limited by the terms of a crowdfunding agreement. Our goal is to continue the finance round (from now on without crowdfunding) to focus on A Class investors. We will continue with negotiations and we hope to reach our aim of 400K € to be able to industrialize our exclusive CPVRS system. We would thank you very much all those investors who participated in the crowdfunding campaign for their trust in our project and in our company. We also would thank Mynbest for their work and dedication. In case you would like to participate in this new finance round, please do not hesitate to contact us. The conditions and shares remain the same, you can find them in here. Yesterday afternoon we introduced our Business Plan 2015-2020 on the occasion of the capital increasing we are now carrying out through a Crowdfunding Campaign with Mynbest. 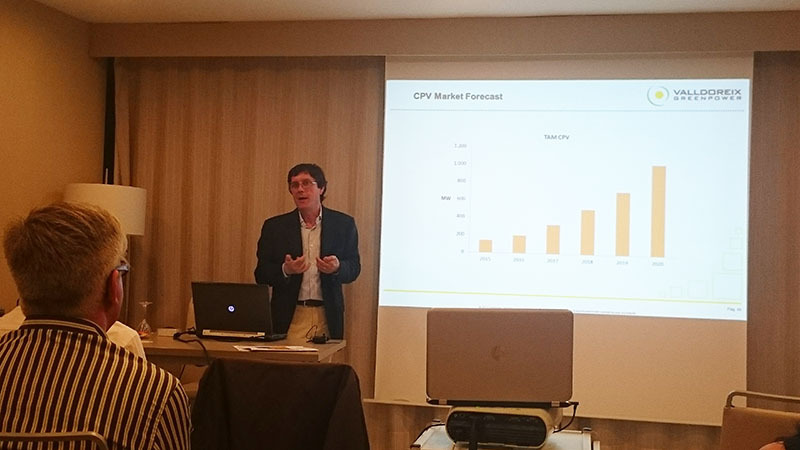 The event took place at the NH Podium Hotel, in Barcelona, and was attended by several potential investors. Ricard Pardell, CEO of the company, led the presentation in which also took part other team members as Eric Martinez, mechanical engineer and Daniel Bernal, electronics engineer, who said that “living the evolution and the growth of the company since the beginning, has been for them a very rewarding and enriching personal and professional experience”. After that, Iíñgo Muñoz, CEO of Mynbest, also took place to describe the crowdfunding campaign, its methodology and all the benefits you can get with it. At the meeting Ricard Pardell, not only exposed the company’s Business Plan, but he also transmitted his experience and professionalism. The CEO of the company holds a wide trajectory in the solar energy field with over 10 years of experience. In 2010, he sold his previous enterprise to Abengoa which meant a 10x exit for the investors who trusted him. That is exactly what we expect from this new funding round; that new investors can get high yields with our exclusive technology while we can increase the manufacturing and commercialization capacity of our VGP product range, and keep on growing. Class A shares require a minimum investment of 40K euros, and have full voting rights. Class B shares starting at 500 euros. Without voting rights but with all the benefits of being a shareholder.